South Korean electronics manufacturer Samsung is gearing up to unveil the Galaxy M-series today (January 28). Aimed at millennials, the Galaxy M-series is expected to have at least two variants – the Galaxy M20 and the Galaxy M10. These India-first smartphones will also be the company’s first to sport a V-shaped notch screen, similar to the dewdrop or waterdrop notch screens seen in Oppo, Vivo and Realme devices. Both these smartphones will be Amazon-exclusive and will be available on the e-commerce platform and Samsung online store. In terms of specifications and features, the Samsung Galaxy M20 is expected to be a power-packed unit in the M-series. It is expected to be powered by Samsung’s recently announced Exynos 7-series 7904 system-on-chip, paired with either 3GB or 4GB of RAM. Though the M-series is expected to feature a triple-camera module in at least one of the devices, the M20 would have a dual-camera set-up on the back – as seen in promotional material and social media campaigns. The phone is also expected to be powered by a 5,000 mAh battery, a first in Samsung smartphones. The Galaxy M10, on the other hand, is expected to be a feature-rich offering with a design similar to the M20. It is also expected to be powered by the Samsung Exynos processor. However, exact model and SoC specifications are still unknown. This phone would also have a dual-camera module on the back. The phone might not get the 5,000 mAh battery, unlike the M20. 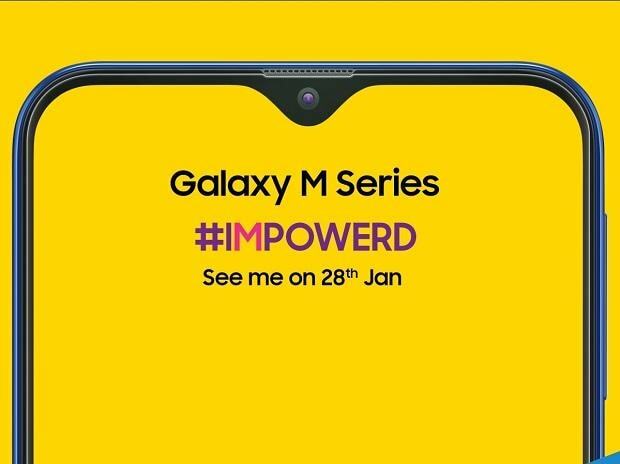 The Samsung Galaxy M-series is set for unveiling at 6 pm on January 28, and the phones are expected to go on sale from the first week of February.